so this is what bakers feel like. gods. i’m surprised they don’t all walk around with a god complex. or a vampire complex–i definitely felt like i could run up a tree with kristen stewart on my back or at least stop a skidding car headed at her with my bare hands after this feat. i baked. and it worked! sure i baked once before, but making a dough that my mom and aunt had personally walked me through four times felt like less of an accomplishment. this time, i did it all myself, the recipe search, the pep talk, burning myself, everything. i’m not crazy. i purposely picked one of those things that bakers are always saying are so easy to make: crackers. let me tell you something, there was disaster lurking around every corner. this recipe made one batch, not two as indicated, and that was with me rolling out the dough super-thin. (and i do not recommend making these crackers very thin. the slightly thicker ones were flakier and tastier.) so they almost burned! it’s not like you can stick your head in the oven and watch them turn colour, the way you can watch hash browns…brown in a skillet. and the actually cutting? sure, they make it look fun on tv, even getting little kids to participate. it didn’t go so smoothly in my kitchen. 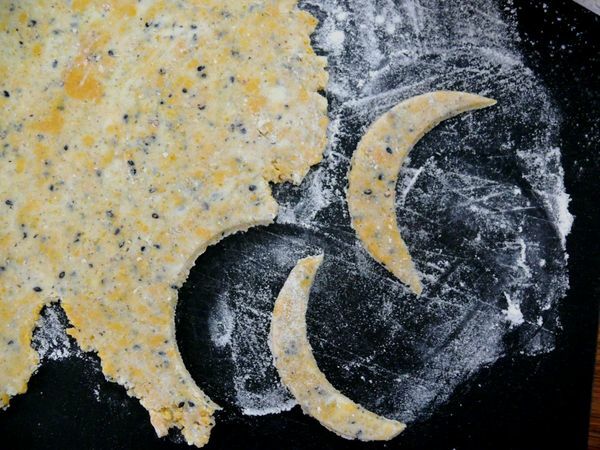 james kindly offered to get a crescent cookie cutter, because i fell so hard for the picture of the little yellow moon when i discovered this recipe, i had to make exactly the same shaped crackers. but of course the store with 30 different-sized snowman cutters didn’t have any crescent-shaped cutters, so i had to coax half-moons from a circle cutter, cutting one circle, then using the arc of that as the inner crescent and so on. in the end it worked out ok. except i was left with a few mangled crescents that looked more like guppies than moons. a few more and i would have had a batch of goldfish crackers on my hands. but i did it! and my plan to actually put some of my cooking magazines and books to use has started. i plan to turn to them at least once a month to try to learn how to make something challenging–at least challenging to me. so expect another baking escapade from me in early may. 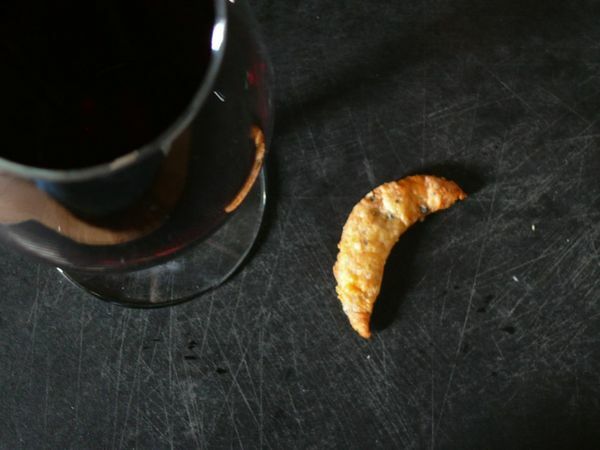 for now, i’m calming my nerves with cheddar moons and red wine. Whisk together flour, cornmeal, poppy seeds, salt, and baking powder in a large bowl. 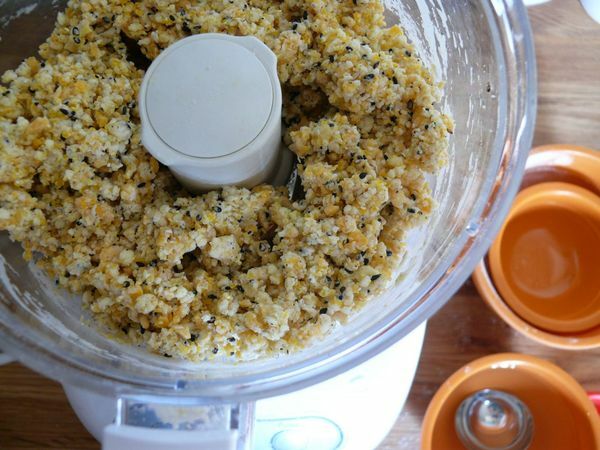 Blend in butter with a pastry blender or your fingertips (or pulse in a food processor) just until mixture resembles coarse meal. Add cheese and 4 Tbsp cold water and mix with a fork (or pulse) until incorporated. If mixture is still dry, add enough of remaining Tbsp cold water until mixture holds together to form a soft dough. Good on you, Yasmin! Love it! I too am trying to take on some more baking/cooking that I consider “difficult” – or even just stuff I’ve never done that I feel I SHOULD have had done by now – and it’s good to make use of those cooking/baking magazines like you said. They have some great ideas! Would you believe yesterday was the first time I made chocolate cupcakes completely from scratch?! I even spiked the icing with Southern Comfort (LOL don’t ask why I had that in my house)! A few months back after I got a pasta machine for X-mas I tried making my own pasta dough for ravioli and while the homemade alfredo sauce + spinach/ricotta stuffing was AMAZING, the dough was HORRENDOUS and it ended in FAR more disastrous results than your poppy cheddar moon crackers: I had to make boxed pasta and slather my delicious filling and sauce on it 🙁 Oh well, we all have our foodie disasters, yes? It’s part of being a foodie! I’m down with the guppie-looking crackers. They look delish. you know the next time, im totally doing ALL guppie crackers, right? hi stacey–thanks for checking out the blog! i remember you from dinner and i loved your video, you have a great site. my mom got a pasta machine for christmas and i really want to go to her house to try a recipe. under her command, im less afraid. i thought about trying a jamie oliver recipe or LIDIA! if i have success, ill be sure to let you know.